Real estate agents can use a new Google app to create and share “photo spheres” (360-degree panoramas) of properties. The photo spheres are no substitute for online 3-D models, but they can still beat 2-D photos. Real estate agents can now use their smartphones to quickly capture and share 360-degree panoramas, or “photo spheres,” of properties online. Google has unveiled a stand-alone app centered around Google Street View, its popular virtual tour feature. Home shoppers have long used Google Street View to virtually mosey around communities. Small wonder that the feature is embedded on myriad real estate websites. 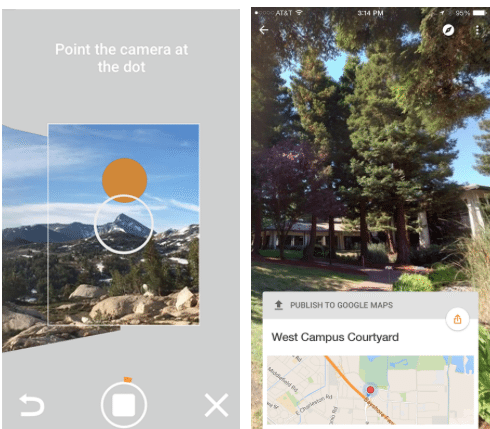 Now they can use Google Street View for iOS or Android to help Google propel its photo sphere coverage far beyond the street. Though advertised as a tool for generating photo spheres of things like hiking trails, restaurants and hotels, the app also seems to provide an easy way for real estate agents to capture and share imagery that can do a better job of conveying the look and feel of properties than 2-D photos. Real estate agents can use a new Google app to create and share panoramas of properties. But for real estate agents who want to get serious about immersive virtual tours, online 3-D model providers such as Matterport and InsideMaps are likely a better bet. Another potential drawback is that users must publish a photo sphere in order to share it with others. It’s not possible to privately send one of the immersive images through the app. But the app could still be a useful addition to real estate agents’ digital toolkit. It generates immersive imagery on listings fast and for free.